In his presentation Firefox OS Architecture and Collaboration Opportunities at XDA:DevCon 2014, Asa Dotzler talked about Firefox as a web browser and mobile OS, and how it exists to ensure there is choice in the marketplace. As it stands right now, the big players are Android and iOS, but a little group of hackers has another option for you: SailfishOS. SailfishOS is the topic of today’s talk. David Greaves is one of the co-founders of the Mer Project, where he focuses on systems and vendor relations. He currently works with Jolla, so he knows for sure that Mer can deliver world-class devices. You’ll usually find David with his friends in #mer working on the SDK, Mer and Sailfish tools, or just keeping things ticking. If you have any problems, just ask and he’ll point you in the right direction.. His presentation is entitled, Sea, Sailfish & Haddock: Shipping Linux to Devices and the Community. 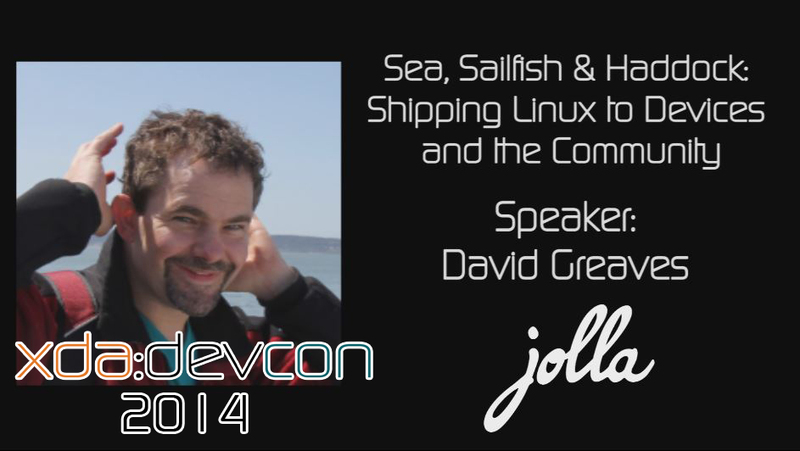 The talk will starts out with a discussion of Jolla Sailfish and the Mer Project. The presentation gives a brief technical overview of how Mer and Sailfish work on devices. SailfishOS is a small device OS, but they are big on community involvement. You will hear from one of the Mer community members who has helped port Mer to different phones. Finally, this talk ends with a call for help. If you wanted to try Sailfish or get involved in the SailfishOS community or Mer Project, David encourages you to explore the information available to do this. Be sure to stay tuned for more exciting xda:devcon 2014 coverage.